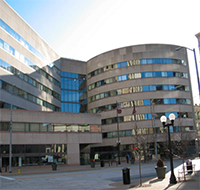 Two new tenants have been confirmed for a downtown office building. Berry Network/Dex YP and local U.S. Census Bureau staff will lease space at 6 N. Main St., situated at the corner of Main and Third. Berry Network will occupy about 19,000 square feet, and the Census Bureau will take 7,000 in the building designed by world famous architect I. M. Pei. In the 1970s. The property was recently purchased by Canadian firm Olymbec, who also own 111 W. First St., where Taylor Communications relocated its staff earlier this year.